This drill will improve footwork and ballhandling skills. It can be done alone or with multiple players in practice. Set up chair, foul line extended, facing the corner. Put a ball on the chair. 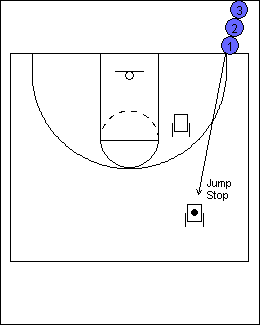 Player comes out of the corner, jumpstop at the chair, pick up the ball and place it in shooting position. 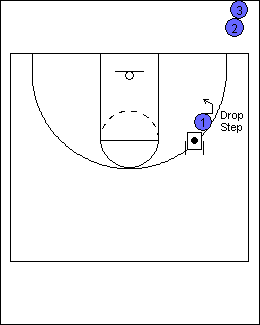 Player then dropsteps to the basket, using the inside foot as the pivot foot, and takes 1 dribble for lay-up. Work both left and right side. 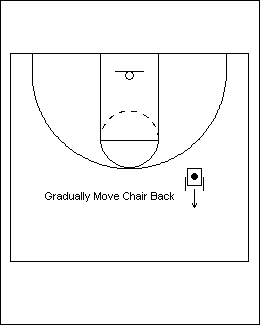 Gradually move the chair back, constantly challenging the player to cover the distance with 1 dribble. When chair is sufficient distance from the basket (35 -40 feet), place a 2nd chair near the lane. 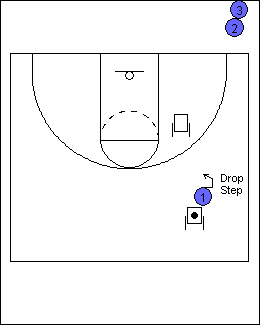 Player comes out of the corner, dropsteps, 1 dribble to the 2nd chair, then a quick-change dribble for a lay-up. As drill progresses, move the 2nd chair gradually closer to the first chair. Challenge the player to attack the first chair, no matter how close, make a change dribble, and get to the basket in 1 dribble from the second chair. This works on attack mentality, change dribbles, handling in close quarters, etc. This drill can be done with any pivot. 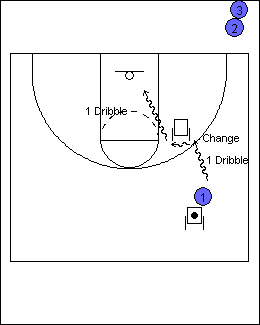 I like the look of this drill and will try it out at my next practice. 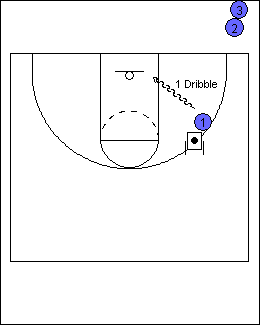 It is a good drill for dribbling. Actually the chairs can be placed at any spot within the perimeter. The players can line up at the base line or the side lines as well. I love your site! I'm in a unique situation and was hoping for some help (why I post on this particular drill- no idea). The school I'm at hadn't won a girls varsity contest in roughly 6 years (0-63, not including forfeits). Our biggest problem is girls not playing. While they're not exactly going to make us a lights out team, our two best girls in the school my first two years have shown no desire to play. As I've looked back over the years, it's a consistent theme where girls will play through elementary and middle school and just not play in high school. How do I change a mentality and keep them interested beyond 8th grade? Our 7th grade team this year was 10-3 and already the best player from that team is talking about not playing. It's been like this for 10 years and needs to change- any thoughts? I read this and ask myself, what was going on in the past? Middle school coaches and varsity coach didn't get along? I was in that situation as a lower level coach but the kids wanted to play here.... Even after I took over as head coach the Jr Hi coach bad mouthed our program. Invite them to a summer camp - even if you have to let them in free. I used to go watch some of their games when I could fit it in to my schedule.... I would definately suggest that you do that... let those kids know that you CARE about them. I take it that you do have some kids come out for the team. Why don't you have a meeting with them and ask them what THEY think the problem is... they might enlighten you. Find out what there ideas are and make some plans - give them some ownership in the program - ask them for their help in rebuilding the program. Ask them IF there are things being said about the HS program..... Find out from those kids what they are doing in the middle schools that you aren't.... not that you have to follow them... but it might give you a few ideas. You really are rebuilding this program... and its not going to be easy.... how many levels do you have? Are the kids you have fundamentally sound? Are the kids in the middle school fundamentally sound? The next thing I would do is to have individual conversations with the kids that are planning on not playing.... find out what they are thinking about and why? Ask them what they would like to see in your program. I know that I am rambling a little here, but not being there makes it tough to say do this or do that... I am just throwing out some ideas for you. By the way - I know that this is NOT news to you.... but I would spend a lot of time on ball handling & passing. In one of my first games a varsity coach, we got beat up pretty good because we didn't handle their press well. I told the kids after the game " This loss is on me, I didn't prepare you well enough for the press... but we will change that starting tomorrow. " There are a lot of drills that you can make your kids tougher when it comes to handling the ball. Yes, it's a cross over from right to left. Once you start going to your left, continue dribbling with your left hand until you begin shot process. As you begin to shoot you will pick up the ball and transfer to your right hand. For the number of dribbles, it depends on the age level and skill of the player. You want to minimize dribbles and maximize distance covered with each dribble. You and the players can experiment and adjust as you go. Joe, when you say ''drop step'', could you clarify? In the first diagram, it indicates the inside foot is going to be the right foot. 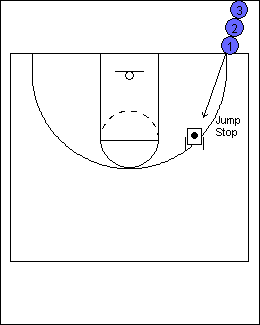 In the second, it says to use a drop step out, using the inside foot as the pivot. This I get, use your inside foot and always pivot facing the basket, be a threat, see the floor, etc. I understand the player has the ball, pivots to the right (with a sweep), ready to shoot. Are you making the drop step after you have put the ball on the floor? Or is that pivot I described the ''drop step'' (different from a post drop step)? Or maybe I have it all wrong? The drop step is the same as a drop step in the post. 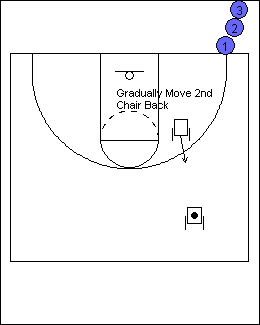 In reference to diagram one, the player would come to a quick stop (jump stop) at the chair. Your body is still facing the chair towards half court. The right foot would be the pivot foot. Then they would take their left foot and step in a direct line to the rim. At the same time they step with their left foot, they extend the dribble. You do this prior to lifting up the right foot to avoid travels. Hi, I really love this website and it really gives me more ideas to practice on. I was wondering do you have any drills that will make me a lights out 3-point shooter, I am a 13 year old girl in seventh grade and I used to be the best shooter but everyone is slowly making progress towards me. Thanks!